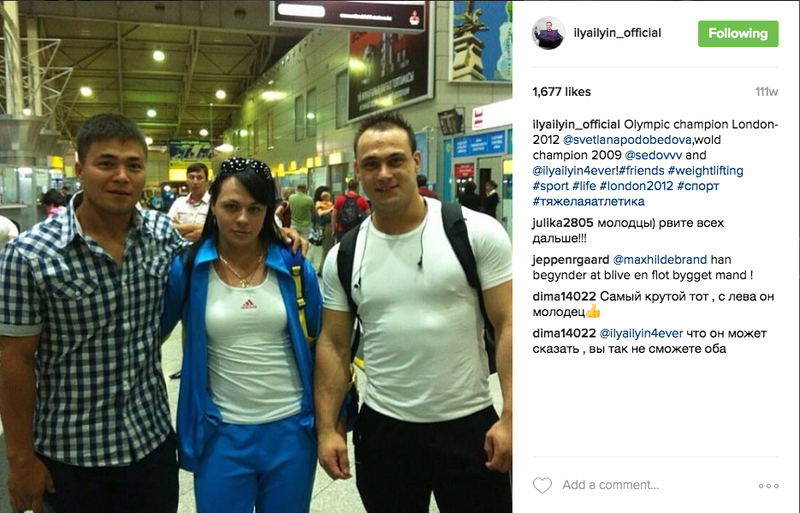 In the latest reaction from the IWF doping allegations and rumors, Vladimir Sedov used his first (and only) attempt at Kazakh Nationals to make a big statement: He thinks Alexsandr Ivanov is the true 94kg Olympic champion from London, not Ilya Ilyin. And it included theatrics normally reserved for the likes of The Undertaker or Vince McMahon. For some context, rumors have run rampant over the past few weeks regarding the IWF and IOC’s announcement that up to 20 retested doping samples from the Beijing and London Olympics came back positive — including those of five Olympic weightlifting champions. It’s important to note that no names have been confirmed by the IWF, IOC, or World Anti-Doping Agency (WADA). But that hasn’t stopped speculation (and it’s nothing more at this point) that one such champion — who could lose multiple Olympic and World titles and records as a result — is Kazakhstan’s Ilya Ilyin. Weightlifter Vladimir Sedov scandal in Kazakhstan Weightlifting Championship. On the video you can see how he goes on stage, he takes off his shirt, shaking her in his arms and shouting: “Here he is Olympic champion!”. Then the athlete throws it to the side stands and walks away. Note that on a T-Kazakh weightlifter was depicted Russian weightlifter Alexander Ivanov, who lost to Ilya Ilyin at the 2012 Olympics in London and finished second. Thus, the world champion 2009, Vladimir Sedov, a favorite national championship in the category up to 94 kilograms refused to participate in the championship, held in Taldykorgan. The post appears supportive of Chinshanlo, but we’ll leave that up for interpretation.